China-Japan Relations and the Role of the U.S.
Time: 9:00 – 5:30 p.m.
China’s relationship with Japan has reached a nadir in recent years with the dispute over Diaoyu/Senkaku islands and with Prime Minister Abe’s visit to the Yasukuni Shrine in December 2013. Is conflict likely between the two countries? How do we assess Abe’s and Xi’s policies toward each other? What is the implication of worsening China-Japan relations for the U.S.? How do we assess the influence of domestic political and economic changes on Chinese and Japanese foreign policies? This conference brought together 14 experts from China, Japan and the United States to discuss the history and current state of China-Japan relations and the role of the U.S. in light of the political and economic changes in both countries, against the background of maritime dispute and rising nationalism in Japan and China. 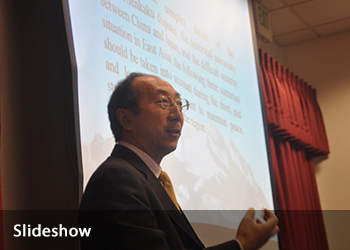 This event was cosponsored by the Fudan-UC Center on Contemporary China.